Its arguable that there is just too much music about on the TV these days and ironic given the years that produced some of the best rock music ever were so poorly recorded. To have no video evidence of ,say, Nick Drake just beggars belief, he made three proper records in proper recording studios but at no point did anyone think it might be a good idea to have a visual record. Its less surprising when you consider that such a record involved a lot more work than whipping out an iPhone and then tarting the results up with the video app. Occasionally at school one of the hipper teachers would announce we would be watching a video, even the dullest prospect (usually Open University) would produce a frisson of excitement because we would be watching a television screen which was entertainment as far as we were concerned. Invariably the whole video/TV combo would be wheeled in, I kid you not, by a man in a brown lab coat. It was his job to get the video up and running which usually meant lots of sucking of teeth and plugging and unplugging before admitting defeat by which time most of the lesson had at least been wasted. For entertainment we were at the mercy of real time programming on 3 terrestrial channels. It would take a while for the intelligentsia to accept rock music as an art form so having a whole weekend live from Glastonbury then was as likely as Jeremy Paxman smoking crack during an interview would be now. Obviously Top of the Pops was going as strong as ever but much as it entertained and frustrated me every Thursday I wanted to see people playing music live. I was genuinely shocked when someone told me that they mimed on TOTP, I really couldn’t conceive how someone could pretend to do something as awesome as to pretend to play an instrument it was just showing off for Rod’s sake! 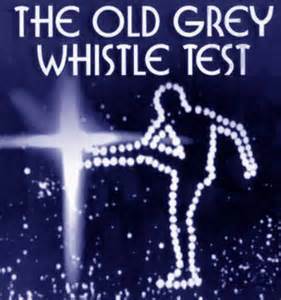 The ‘serious’ alternative to T OTP was the Old Grey Whistle Test which was generally treated with such disdain by BBC programmers that it might pop up literally anywhere in the schedules, usually as late as possible but I do remember strange period when it appeared on Sunday afternoons. Bob loved West Coast Rock and the OGWT loved singer songwriters largely because initially they were given such a small studio that proper bands posed all sorts of logistical problems. This led to the other major problem that it was hard to record live bands in such a small space so inevitably bands sang live over a pre recorded backing track. This was far more dishonest because the bands took the trouble to cart amps into the studio and actually plug in which fooled me for a number of years. I used to devour any OGWT I could find which as I’ve already stated was a challenge in itself but inevitably it was usually a disappointment. My diligence was rewarded though when The Sensational Alex Harvey Band hit the broom cupboard. I was vaguely aware of SAHB and was already a bit scared of them. The main reason for this being that they came from Glasgow or more precisely the Goballs. Bear in mind about 99% of my information about Britain came from the TV. Newcastle looked a bit rough but the people seemed nice (I had watched the Likely Lads for years) and so I was able to embrace Lindisfarne. Glasgow, on the other had just looked dangerous, Lulu seemed nice enough but there wasn’t a lot else to recommend it. On returning from a family camping holiday in the highlands (the furthest we ever travelled in the 70’s) we passed though Glasgow and by god it looked rough. The 70’s were grim for a lot of us but Glasgow must have had it worse than most. I also watched a dramatisation of Jimmy Boyle’s A Sense of Freedom which rather supported my case although I suspect if you did a story about a dangerous gangster set in Chipping Norton it might reflect badly on the area. Alex himself didn’t really help the case though though. He was officially the oldest man in rock having been crowned the Scottish Tommy Steel in the 50’s and having spent the next decade playing all over the place in his soul band as well as playing in the pit band for the musical Hair. More recently he had been paired up with Scottish rock band Tear Gas who knew how to play but needed something extra which Harvey had in spades. Its a great song by Jacques Brel (famous Belgium alert) but I didn’t know that, I was just terrified by the whole thing. AT the time of making this the impossibly aged Harvey was in his late 30’s. We regarded it implausible that anyone this old could make music at all but as far as I was concerned this is one of the bestest things I have ever seen on TV. In just over 10 years he was dead from a heart attack but his career was well on the wane by then. He was almost inevitably a heavy drinker. Our paths crossed in 1979 at the Glastonbury festival which was a million years off the mega global spectacular it is today. Some one had the brilliant idea of an all star ‘jam’ and among the people I can remember being wheeled on stage were Tom Robinson, Steve Hillage Nona Hendrix ( I think) and Alex Harvey. Alex was completely off his face, he did Bob Marley’s ‘small axe’ and insisted we all sing along. When the crowd proved less than enthusiastic he was very rude to us and even from the safety of the crowd I was still just a little bit frightened ! This entry was posted in Uncategorized and tagged 1970's, 70's biography, 70's music, alex harvey, Bob Harris, Britain, old grey whistle test, rock music, SAHB. Bookmark the permalink.